Rosella (Hibiscus rosa sabdariffa) is very famous plant in Indonesia. Previously, the plants flower pod is known as frambozen and materials are often used to make a framboze syrup. Just now, rosella flower sheath, known as the herbal tea drink called rosella. Rosella plants growing in many countries, such as Sudan, Mexico, Jamaica, Brazil, Panama, to several states of the USA and Australia. Many people take the plants that came from Africa. For, indeed, many plants found there. Distribution can not be separated from the slave who was sent to some parts of the world. Plant is known in various names, such as jamaican sorell (West India), oseille rouge (France), quimbombo Chino (Spain), karkade (North Africa), and bisap (Senegal). While in Indonesia, the plant is more commonly known as green mrambos (Central Java), Asam Jarot (Padang), Asam Rejang (Muara Enim), etc..
At the plant, the flower is not nutritious, but the red sheath of its flower. Indeed, the sheath shaped like flowers, especially if it is dried. Sheath can be consumed in the form of fresh and boiled such as tea. Rosella flower sheath in the form of a fresh can be used to make foods such as pudding, salad mix, juice, candy, jelly, and syrup. Besides the delicious taste, flower sheath has the true enough of complete pharmacologic effect. Active material from the sheath of rosella flowers are grossypeptin, antosianin, gluside hibiscin, and flavonoid. Each 100 gram sheath of rosella flowers contain 260-280 mg vitamin C, Vitamin D, B1 and B2. Gynecology vitamin C, 3 times wine black, 9-fold citrus orange, 10 times more than the fruit star fruit and 2.5-fold compared to vitamin C in guava fruit. Inition, tea contains Rosella High Calcium (486mg / 100 gr), Magnesium and Omega 3. Rosella Tea also rich of Vitamin A, fe, Potassium, Beta & Carotene acid essential. Flavonoid interest in the sheath is very useful to prevent cancer. In fact, some scientists call flavonoid that can treat cancer, especially because the free radicals, such as stomach cancer and leukemia. In addition, rosella tea can be used for people with hypertension, heart disease, osteoporosis and throw urine (as diuretic), smooth the flow of blood (blood can reduce the thickness), prevent infection (as antibacterial, antiseptic, and anti inflammation), treat mouth sores (because containing of vitamin C), reduce blood cholesterol level, etc.. Special diabetics mellitus, in addition to lowering blood sugar, rosella flower sheath can cure disease (probably due role in flavonoid neutralize free radicals that cause damage to beta cells pancreas that produce insulin). Plants flower sheath a red, old, thick and fleshy. The dense red color, the more sour taste with the benefit that is also bigger. Rosella tea can be made in the following way. Take three to four fresh rosella flower bud, clean wash, and then add with hot water (one cup). After a few times, press to the sheath so that the water colored red, and then filtered. Water can then be drunk. A day, drinking one to three cups of rosella tea. To be more comfortable, can be added a honey and lime juice. 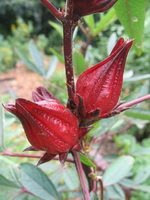 For dried rosella flower sheath, take three to five bud and add with a glass of hot water. Wait three to ten minutes. Then, it can be drunk as much as one to three times per day. To be more delicious, can be added honey or sugar, or with ice cube.